Could not agree more. Indeed, show off! I wish I could show off like this… Well done! Let me clarify: the art is original and very well done, but whoever did it didn’t do it on a grocery list notepad with a ballpoint pen. Yes they did. Why is it so hard to believe that we artists like to doodle on EVERYTHING. 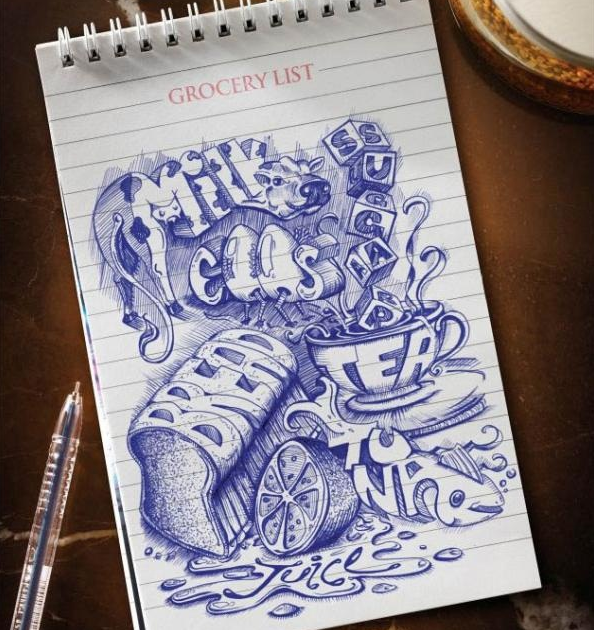 Blue ballpoint pens are a favorite among us artists for doodling. This picture is 100% legit. There isn’t the merest hint of a crease, smudge or pen impression –the kind you get when you toil over thin paper with a ballpoint for an hour or so. Nobody doodles that perfectly –take it from another artist and lifelong doodler. Not the kind your wad up and leave in the cart or throw away at the end. ball points are the best for drawing, mainly ‘cuz everyone has some laying around, and we’re all familiar with how they feel.